Development of an EGS system from the ground up involves many steps. Well stimulation with TZIMs is used to create a multi-zone EGS reservoir in hot rock. Production wells are drilled into the EGS reservoir, and circulation from the injection well through the hot rock and into the production wells brings steam to the power plant. 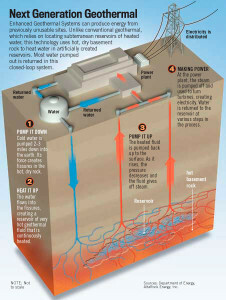 Geothermal power is a reliable, clean source of power that provides baseload electricity 24/7 rain or shine. Geothermal power plants have the least down-time of any source of power including coal, gas, oil, hydro, solar, wind, or nuclear. Geothermal plants emit only a tiny fraction of the emissions that fossil fuel powered plants do, and there is a seemingly endless amount of heat near the Earth’s surface that remains untapped for power production. These artificial systems are called Engineered or Enhanced Geothermal Systems (EGS). Creating artificial geothermal reservoirs for an EGS involves using hydraulic pressure to create a network of small, interconnected fractures in the rock that act as a radiator, transferring the heat in the rock to water circulating through the system. Hydraulic pressure is applied to “stimulate” existing cracks in the rock to slip, opening slightly and increasing rock permeability. The slip is caused by the tectonic forces that exist in the earth’s crust and are enabled by the lubrication from the water in the opened crack. This stimulation process is called hydroshearing. At first glance, it appears to be similar to hydraulic fracturing (aka fracking) used in the oil and gas industry, but there are key differences. AltaRock’s hydroshearing process uses moderate pressures to open very small cracks (1-2 mm) with the goal of creating a network of thousands of permeable cracks within a reservoir. These small cracks are more efficient at transferring heat into the circulating water. Fracking uses much higher pressures to initiate new tensile fractures. These propagate rapidly away from the well and result in wide cracks that require proppants to hold them open. Hydroshearing utilizes the rough surface texture of rock fractures to allow self-propping of open fractures. Furthermore, hydroshearing does not use chemically-based fracking fluids; only water is pumped into the well during hydroshearing, eliminating the problem of ground water contamination. AltaRock has developed a revolutionary new technology which makes multi-zone EGS reservoirs possible. One way to think about it is stacking reservoirs on top of each other like a high rise building stacks office space. Just as the multiple floors in a high-rise office building allow dramatic increases in density on a single piece of real estate, multi-zone stimulation increases the amount of rock (and heat) that can be accessed from a single well. Multi-zone stimulation increases the size of the reservoir and the amount of energy that can be produced from the well by a factor of three or more. Stimulating multiple zones requires that one zone be sealed off before another zone can be stimulated. While other companies have tried using mechanical techniques borrowed from the oil and gas industry to block successive stimulation zones, AltaRock has developed an advanced, biodegradable diverter made from thermally sensitive polymers to block successive zones. This approach reduces the risk of equipment getting stuck in the wellbore, and eliminates the cost of having a drill rig on-site during the stimulation process. Until this process was developed, EGS was experimental, expensive, and not commercially competitive. Wells with a single permeable zone simply do not produce enough hot water or steam to pay for the capital investment required to drill the wells and create the system. Increasing the flow of hot water or steam three to five times with multi-zone stimulation leverages those capital costs, and can decrease the cost of power produced by over 50%. Put in real-world terms, a typical single-zone EGS with one injection well and two production wells might produce on the order of 1.5 MW of power. Using multi-zone stimulation on the same 3 well layout would result in 10-15 MW of power production. A five acre geothermal pad could support nine directionally wells, three injectors and six producers. In this scenario, a single-zone EGS could produce 5 MW of electricity on the five acre pad. Multi-zone EGS would produce 30-50 MW of electricity on the same pad. The capital investment for the single-zone and multiple-zone systems is similar, so the ramifications for return on investment and power generation are dramatic and quite clear. A 2007 study led by the Massachusetts Institute of Technology estimated that with suitable investments and improvements to existing technology, EGS could supply up to 10 percent of the country’s electricity needs within 50 years at prices competitive with fossil-fuel fired generation. The report, The Future of Geothermal Energy–Impact of Enhanced Geothermal Systems (EGS) on the United States in the 21st Century, may be found online at http://www1.eere.energy.gov/geothermal/futuregeothermal.html. 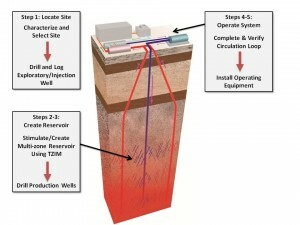 These same techniques can be applied to existing geothermal fields to dramatically increase power production and extend the life of those fields by expanding and enhancing permeability into previously impermeable rock. This greatly increases the heat transfer efficiency and steam production of the field which leads to an increased power production capacity. AltaRock estimates that we could effectively double the power generation capacity of the existing geothermal plants in the U.S. using this method; an increase of over 3 Gigawatts of clean power to the grid without developing a single new field! 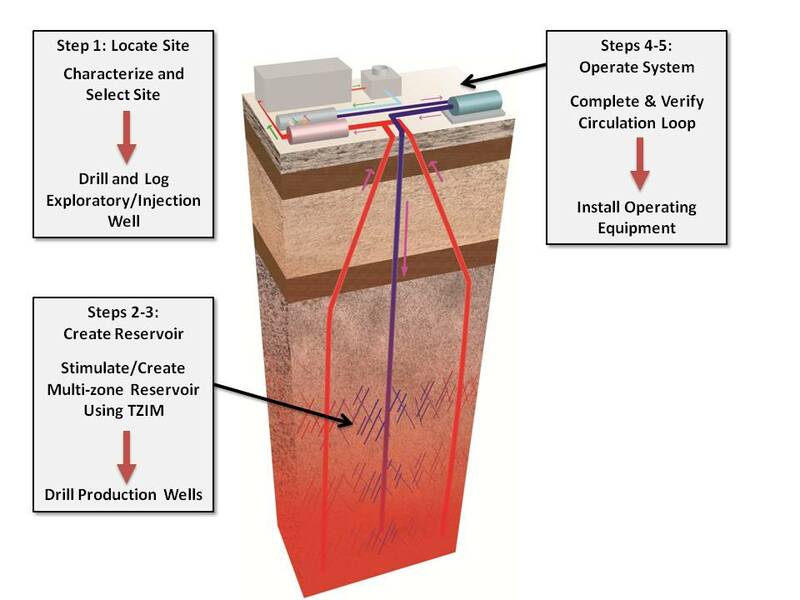 The EGS concept provides the potential to remove the “dry hole” risk associated with conventional geothermal, which require finding existing fractures that contain economically viable flows of naturally occurring hot water. Enhanced geothermal systems have the potential to allow the development of geothermal power projects at sites without conventional geothermal resources. With this technology, EGS can be applied in many areas not suitable for conventional geothermal development. The ability to engineer a geothermal reservoir and develop fluid circulation through hot rock means that many new areas could be producing clean, renewable energy in the near future from the ground beneath our feet.